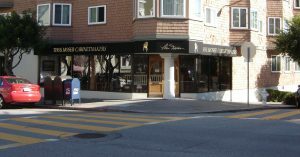 Good design is good for business, and American Canvas & Awning in the San Francisco Bay area brings many years of design experience. Whether you need an awning for your restaurant, hotel, storefront, office, commercial building, or home, we have just the right custom awning design for your special needs. Here are just a few of our recent fixed-frame awnings jobs. Find more in our traditional awnings gallery. 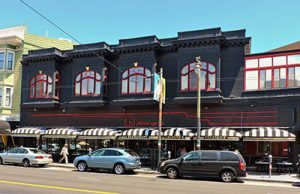 American Canvas and Awning installed the original awnings for Calzone’s Restaurant in San Francisco, CA from a sketch done by the owner after a trip to Europe. These are horizontal, dome-style awnings with custom frames. We recovered them with custom-welded stripes for an updated look. The finishing touches are gold-leaf stripes and lettering. The awning fabric is a light fire-resistant material to filter the sunlight in daytime, and to reflect the lights from the restaurant at night. The valance is double-layered with light horizontal stripes and gold leaf lettering against a black background for a striking visual effect. Another restaurant, Mangiare Restaurant in San Francisco, CA, opted for a different look. 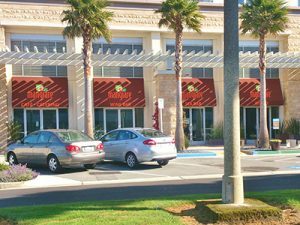 These are traditional awnings on a custom frame, and the multi-colored graphics enhance the brand and add color and attention to the storefront. 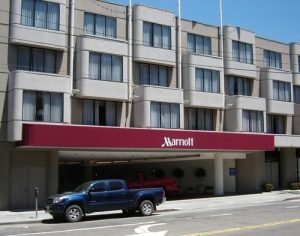 Marriott Fisherman’s Wharf in San Francisco, CA is fitted with a sloped top box awning with curved ends. This allows an impactful vertical face and allows for lights mounted inside the awning. The Marriott logo graphics are RF welded white translucent letters which are lit by interior lighting. The awning also has a soft glow at night. There is a soffit ceiling made of mesh material to diffuse the light and drain any moisture. Lunardi’s Market in San Bruno remained open during a major renovation. We provided a walkway and easy customer access and worked on one awning at a time, keeping the other areas clear. When the classic Safeway facade was removed, we measured all the vertical support columns and designed the lower mounts of the awnings to attach directly to the building’s vertical support structure. This provides a secure awning to withstand the heavy afternoon winds. 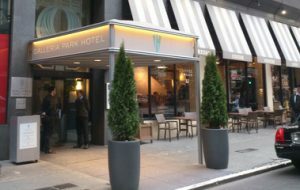 The Galleria Park Hotel opted for an exterior framed canopy for their entrance. This canopy is built with the main frame on the outside of the canvas and finished with powder coat paint for durability. The frame is all 2" tube stacked in tandem supported at the front by three tubes clustered together. A lightweight steel tube frame for the canvas canopy sides, a gently curving top, and a separate ceiling panel with stripes at an angle complete the look. LED lighting was installed to provide light at night. Thos Moser Cabinetmakers opted to enhance their awning design with the features of their building. This box shape awning follows the contours of the bay windows above. It’s designed with standard sloped interior ceiling and finished with lettering is done in gold leaf for a long-lasting shine. 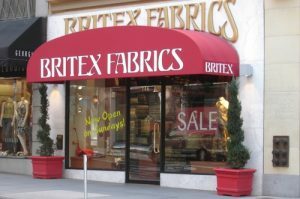 Britex Fabrics wanted their logo to be as large as possible, so American Canvas and Awning designed a large span curved awning with a complex curve. The flat face allows for maximum graphic area. We can make awnings in any shape and fabric, and we will custom design awnings for your space. 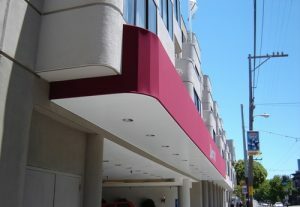 Because our family has been designing, fabricating and installing custom awnings and canopies in the San Francisco Bay Area for more than 100 years, we know, and love to tell, the history of canvas awnings. Check out our custom awnings resources page or call us at (415) 826-7515 for new custom awnings or when your existing awnings need to be repaired or re-covered.